I’ve always had a soft spot for pinwheels. No matter how old I get, I have a feeling I’ll always enjoy them. 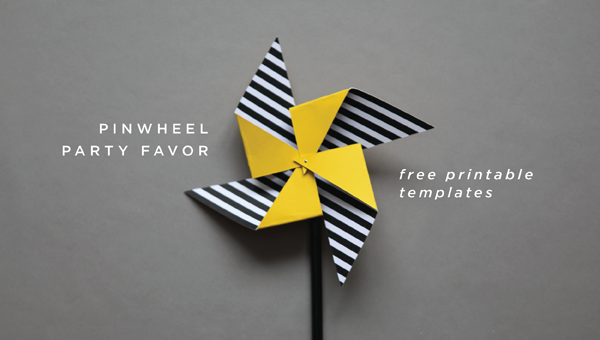 Click the link below to download the template…follow the simple step by step instructions and you’ve got a colorful party favor, decoration or even activity for your next party! Tip: If these colors don’t match your next party, just print off the template and use paper of your own! Step 1: Gather supplies (cutting board, ruler, scissors or exacto knife, pins, and pencils or straws). Print off colors and patterns of choice (front + back). Mix and match the colors and stripes to your hearts content. Step 2: Place your template on paper and cut around edges. The template fits two squares per page, so space accordingly! Use the diagonal lines to cut your flaps. Step 5: Take a pin and poke a hole through the end of each flap. 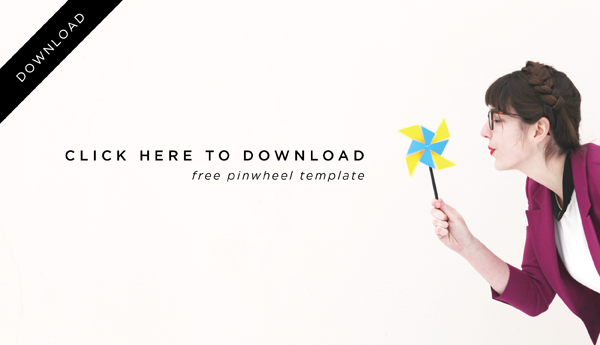 Once through all four flaps, press through to the back of your pinwheel. Step 6: Push pin through the eraser of a pencil. 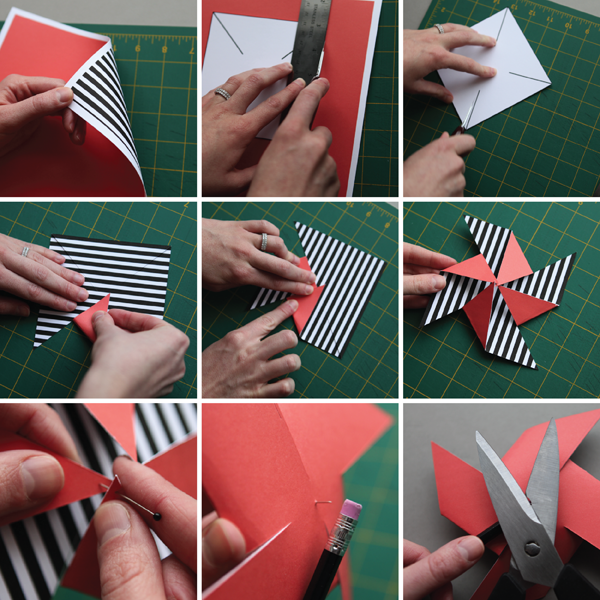 Test the pinwheel for pin length, then cut off the sharp point with scissors or wire cutters. Push the now dull edge of the pin flush with the eraser. They stay put very well…but just to be safe you can always glue it in place. 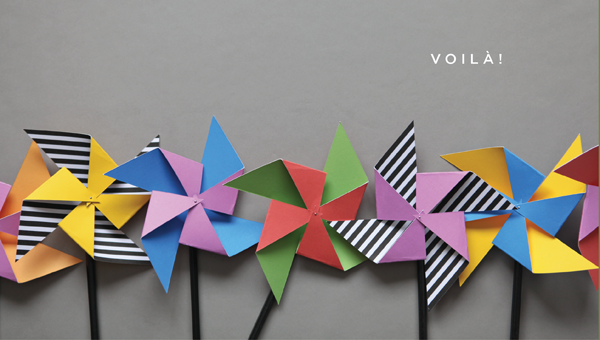 These pinwheels take very little time to make. They are fast and fun and perfect way to add some color to your next party. Click the link below to download. These paper look kind of Kate Spade -ish. I love it!!!! Thanks for these fabulous printables!! cute outfit there in that last photo, ms amanda! oh wow!!!! thank you for this. looks so cool. i might include it in Beth’s party favours for her 6th birthday party next week. how awesome. Oh how fun! I’m thinking of having a spring time outdoor dinner party in March. These would be a nice touch. i agree with sarah park above. these have a lot of kate spade flare… colorful, whimsical. super cute. Oh my goodness pinwheels! I once put pinwheels all over my friend’s yard for her birthday. Ahhh!!!! stop being so good and cute and awesome!!!!! Super cute! May have to use them for my daughter’s birthday party! this is my fave DIY you’ve done, Amanda. I love the styling, the grey background, the last photo, the color combos, the stripes, the geometricness of the pinwheels. love it. Gorgeous! I too am a pinwheel addict! Thanx for the template and sharing the loveliness! How fun! I love the solid color and pattern combo. how cute and a wonderful childhood memory! love these! so fun and playful! my fave are the bold black and white stripes with the hot pink! That’s so fun! Thanks for the download! Love the yellow and striped one! My pinwheels are not spinning? Help! Move the pin around in the paper to make sure the hole is big enough. These are adorable, Amanda. I just realized you’re the same Amanda who was in my printmaking class at Alt, right? And the designer for Kinfolk? I just got my first issue in the mail, and I love it.